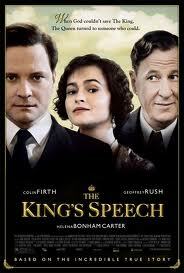 Firth is truly amazing portraying King George VI (Elizabeth II's father) who battled a severe stuttering problem since early childhood. Although his speech issues made fufilling many of his royal duties very challenging, as 2nd in line to the throne, he felt somewhat protected from intensity of the limelight as it would be his brother David who would be King. Still needing to find a way to master his speech problems, with the help of his wife Elizabeth (well played by Carter), they find Lionel Logue (Rush). Logue uses what were considered unorthodox methods to helps his clients overcome their speech impediments, which includes a level of familiarity which was quite different for a royal, including the impertinence Lionel calling him "Bertie", his family name. When his brother David (Edward VII) abdicates in order to be with Wallis Simpson, Bertie is thrust into the role of King and with the introduction of radio and the pending start of WWII, his ability to address his subjects becomes vital for the nation. Using close ups and depth of focus, the director cleverly draws us into the story. Hard not to feel compassion for this man struggling to fulfill duties he never asked for or wanted. Again..props to Firth for this role. It must have been quite difficult for Firth to effectively portray a man with a speech impediment, when he doesn't have one. Interesting fact: Geoffrey Rush was one of the producers. Always love you reviews, I'll definitely put this on my to see list. I tried to send an email to you to express my sympathies for the loss of your dad but it came back to me. Thinking of you and all those who loved him. I too saw this movie and loved every minute of it. If the movie "The Fighter" wasn't also released this year I'd say The King's Speech was a shoe in for all of the top awards. I've got to see that one too! Thanks for sharing your review, I've been wondering about this movie. Will have to make a date night this weekend.